The Hong Kierkegaard Library hosted the Eighth International Kierkegaard Conference during the Summer of 2018. The topic: “The Wisdom of Kierkegaard: What Existential Lessons have you Learned from Him?” For additional information please refer to the Conference Program published by the Hong Kierkegaard Library. 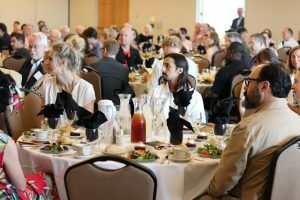 On Wednesday, June 13th of 2018, the Eight International Kierkegaard Conference began with an Opening Dinner and Plenary Lecture in one of the on-campus ballrooms. Nearly two hundred renowned Kierkegaard scholars reigning everywhere from Nigeria to Slovakia to Brazil attended the Conference. More than seventy-two Kierkegaard scholars set forth their papers in two of the College’s on-campus academic facilities, Viking Theater and the Center for Art and Dance. The topics ranging from The Courage not to Be: Kierkegaardian Reflection on Suicide and the Temerity of Joy to Kierkegaard and the Desirability of Immortality, the diversity of the speakers in these twenty-minute sessions in combination with their passion for Kierkegaard produced lively conversation after each presentation. 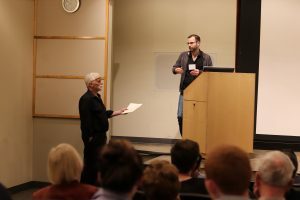 The Dissertation Panel took place on Thursday evening and resulted in a remarkable dialogue between seven fellow Kierkegaardian scholars, each with unique areas of interest in the multifaceted field of existentialism. A Fellow of the Kierkegaard House Foundation 2017-2018, Andrés Roberto Albertsen initiated the Panel with the topic of Love and Politics: A Convergent Reading of Hegel’s Philosophy of Right and Kierkegaard’s Works of Love. The following six panelists (Ruby Guyatt, Paulo Henrique Lopes, Tomer Raudanski, Valérie Roberge, Troy Wellington Smith, and Fernanda Winter) each illuminated new perspectives on the works of Kierkegaard. It was a remarkable evening. Saturday the 16th ended on a more somber note. In the College’s Heritage Room many of the scholars gathered to share memories of Robert Perkins, a beloved Kierkegaard scholar whose prolific works have left a lasting impact. The Memorial Gathering lasted an hour and provided a reprieve from the excitement of the past few days. These sessions featured Kierkegaardian scholars who wished to present a paper about the existential lesson they had learned from Kierkegaard in either the Spanish or Portuguese language. Featuring scholars who came from all around the world — Italy, Mexico, Argentina, Texas, Portugal, to name a few — each session gave excellent presentations on topics such as La contemporaneidad como concepto dialéctico respecto al tiempo and A possibilidade de viver una existência experimentante. 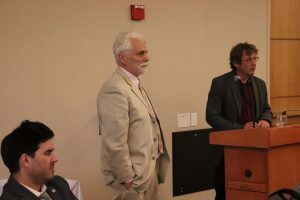 Providing a great opportunity for all scholars to reflect on the Danish scholar in a different setting than the typical presentation done in English in the lecture halls, the Spanish and Portuguese Presentations were an unforgettable experience. After the Spanish and Portuguese presentation sessions finished, the Translation Seminar began with the participation of Kierkegaardian translation specialists present in-person or online. 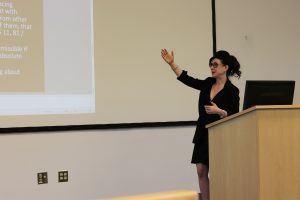 This seminar-style session offered a space for scholars to share their own experiences, materials, resources, ideas, difficulties, proposals, and the latest news in the world of Spanish and Portuguese existentialist translations. Zoom, a video-conference program, allowed for the opportunity to bring in guests from all around the world. Together, the scholars considered several concrete translation cases and discussed the specific semantic and grammatical challenges associated with each case. The Translation Seminar proved both an informative and exciting end to the Conference’s academic sessions. The lunch was a cheerful event filled with celebration and, of course, many conversations about the enigmatic 19th-century Danish philosopher. The week was over and the flurry of Conference activities finally began to slow. The goodbyes that followed the Closing Lunch were bittersweet. 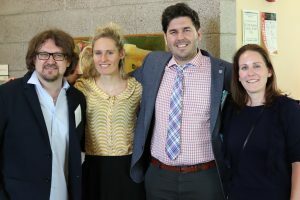 The Conference brought together hundreds of international Kierkegaardian scholars and gave them the opportunity to unite and share ideas as a community at one of the largest collections of Kierkegaard’s works in the world. The Conference took place across the campus of St. Olaf College, one of the nation’s leading liberal arts institutions. Similarly committed to global education, more than 70% of St. Olaf students participate in oﬀ-campus study programs. St. Olaf President David Anderson observes that these diverse learning opportunities St. Olaf College offers work together to provide all students with “the base of knowledge, skills and proﬁciencies, experiences, and habits of mind and heart that will enable them to ﬂourish in whatever future awaits them.” Combining rigorous academic programs with a tight-knit community, St. Olaf College truly provides a welcoming academic environment for all learners. For more information and exclusive event photos, check out our Hong Kierkegaard Library Facebook page.